Simultaneously charge two mobile devices as well as using your existing power socket with this pass through-enabled USB mains charger with built-in surge protection 'value twin pack'. Featuring a 2.1A total output, this adapter also offers fast charging. I have found this to be a useful accessory as you are able to charge two devices simultaneously while also able to use the mains socket for another mains appliance. The anti-surge also gives peace of mind - though I have to take that on trust as I, fortunately, have not knowingly suffered a significant mains surge. I have found this to be a useful accessory as it has two USB sockets charging my phone, or wireless speakers etc as well as providing surge protection for mains appliances. I have bought a number of these now for use around the house and for taking on trips away from home. I wanted a USB charger that would be suitable for charging a multitude of different devices - iPad, iPhone, Kindle, Samsung phone etc whilst still allowing the socket to be free for other electrical equipment. This does all of that. The only downside is that the masterplug does have a light on it, which, for use in the bedroom, can be a bit bright for some people. This pack features not one, but two of these fabulously popular and effective devices. You can't have enough of them, so why not buy two at the same time and save money too? Using your existing charging cables, the Masterplug can be used to charge smartphones, tablets, iPhone, iPad, iPod, MP3 players, digital cameras and e-readers. Designed to maximise space efficiency and keep your area organised, the Masterplug USB adapter is great for charging two USB cable supported devices simultaneously from just one mains power socket. 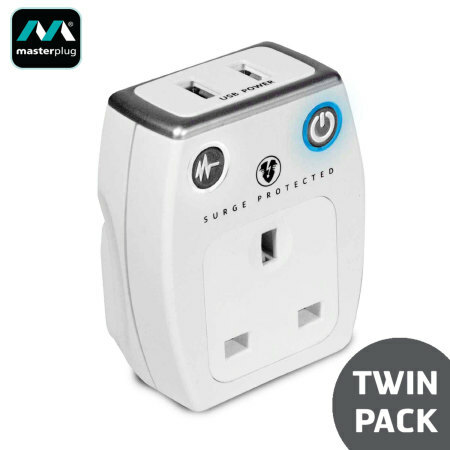 Offering an impressive total 2.1A output, the Masterplug Surge Protected USB and Mains charger is perfect to charge your power hungry devices, such as tablets and smartphones. Additionally the 2.1A output means that your devices will be charged quickly, so they're ready to use for when you need them. Not only does the Masterplug allow you to charge USB devices, but it also ensures that the mains socket is available while the USB adaptor is in use. 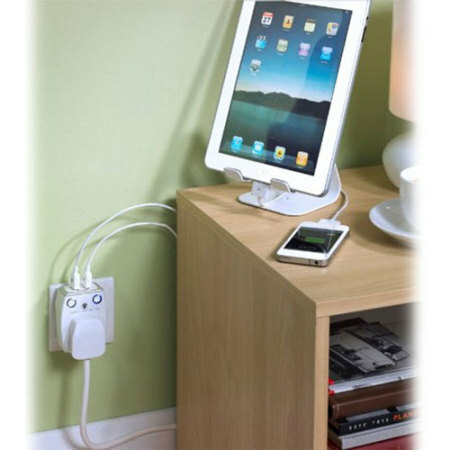 This means that you do not need to sacrifice the use of a power socket in order to charge any of your devices, allowing you to use the free socket for your bedside lamp or for charging of a laptop. 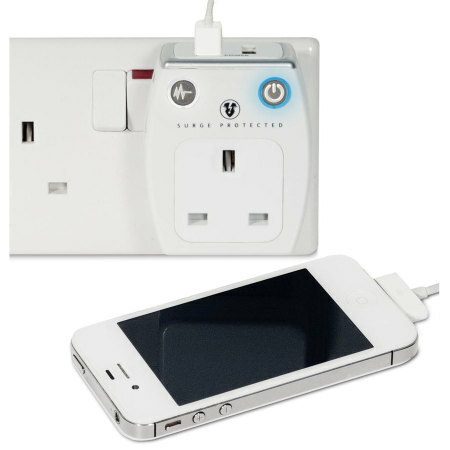 Measuring only 5.5 x 7.4 x 6 cm, the Masterplug is compact enough for travel use and can be used discreetly on power sockets without looking unsightly. Also includes LED indicators for both power (blue) and surge protection (white), to show that the power is connected safely and ready to use. The Masterplug has been specifically designed to filter out high voltage surges and spikes from the mains supply, thereby preventing potential damage caused to computers and sensitive electronic equipment. 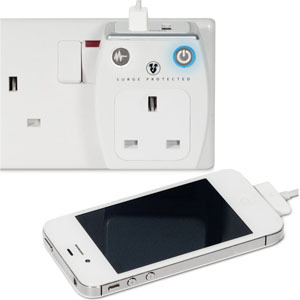 Confident in their ‘state of the art’ technology, Masterplug Surge products come with an unlimited value ‘Connected Equipment Warranty’. In the unlikely event that a surge passes through this protection device within 3 years of purchase and damage occurs to the connected equipment, Masterplug will pay to repair or replace the equipment.